On July 1, I had the pleasure of presenting the Saville family with the first certificate of completion in JJML’s Sag Harbor Historical and Cultural Geocache Hunt. Working together, Maggie, Brian and Pattie Saville were able to find all six hidden caches, and stamp their “passport” with the colorful rubber stamp they found in each cache. Amazingly, they completed the entire hunt in just a little over two hours. We think that may be a record that stands for quite some time. Our congratulations go out to the Saville family, and our invitation to take part in the geocache hunt goes out to everyone reading this and everyone you know. The hunt is open to all (you don’t need a library card, or even have to be a resident of Sag Harbor). 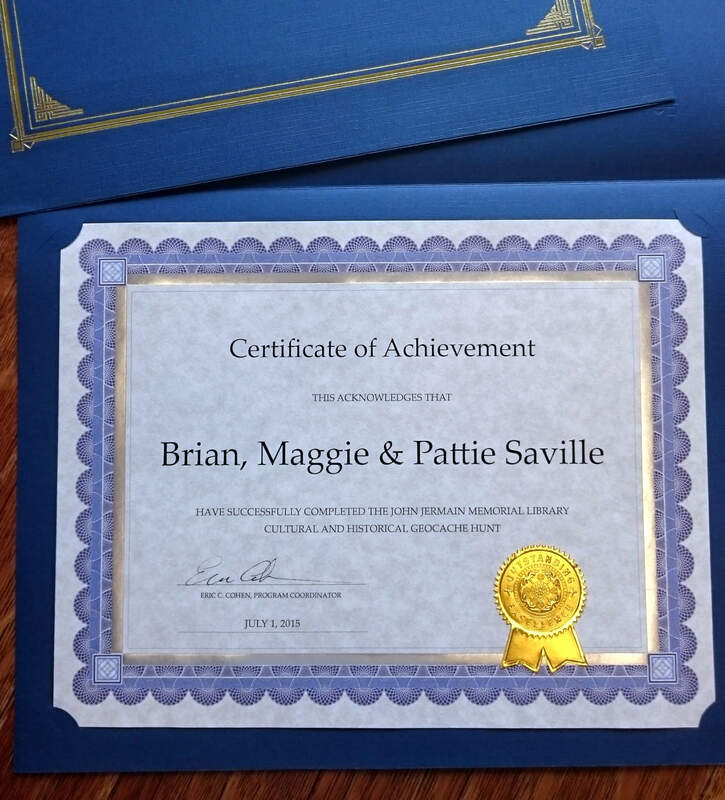 Everyone who completes JJML’s geocache hunt receives a certificate exactly like this one. Geocaching is s great family activity that allows the entire family to share in a fun outdoor adventure. More information about our Geocache Hunt, and geocaching in general can be found in a previous blog post: Geocaching History and Culture Hunt Is Now Live!